​SRD was divided from the Rwenzori Diocese on 26th August, 1984, with the Rt. Rev. 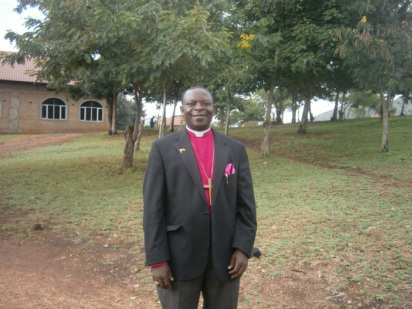 Zebedee Kahangwa Masereka as the first Bishop. At that time, there were only 26 parishes and 33 priests. Now we have 38 parishes and 85 priests. Our current Bishop is the Rt. Rev. Jackson Nzerebende. Create the opportunity for the Bakonzo people to develop their own identity as one of the tribes of Uganda, as a way of minimizing the effects of the longstanding hostilities between Batooro and Bakonzo since the 1930's. South Rwenzori Diocese is located in the Southwest of Uganda and covers the same area as Kasese District. To the South is Lake Edward and to the West is the border with the Democratic Republic of the Congo. It is set across the equator and on 33 degrees E, with an area of 5800 square kilometres. district. The lowlands are over 600 metres above sea level, while the highest peaks are over 5,000 metres above sea level. On the Eastern side, the mountains slope down to a plain. At the foot of the mountains is Kasese Town, the administrative centre for the District. Kasese is also home to the Diocesan Office and St. Paul’s Cathedral. The Church of Uganda is part of one Holy, Catholic and Apostolic Church, worshiping the one true God, the Father, Son and the Holy Spirit. To restore positive religious, socioeconomic and cultural values and morals for the improved quality of life for the community. To nurture humanity holistically through preaching, teaching/training, healing and caring so that they may have abundant life. 1. Non-discrimination: Respect of humankind irrespective of ribe, belief, and ethnicity, political, social and cultural status. Respect for all is an essential precondition forcommunication, team work and productivity. 2. Uphold practical Christian living: Equity and social justice require spiritual growth for effective co-existence. 3. Transparency: We are accountable to God for the use of our time and resources. We are accountable to our partners and supporters. We aspire to be honest, trustworthy and transparent in all that we do. 4. Commitment: We are committed to constructive partnerships and relationships. The rolling out and interpretation of the integrated ministry strategic plan (IMSP) 2011 - 2020 in parishes, for effective implementation. Effective improvement in maintaining Bishop's office staff welfare in terms of regular salary payments. The third phase of St. Paul's Cathedral construction, which includes tiling, veranda construction and finishing, estimated at Ug. Shs. 200million. Implementation of income-generating projects, such as the completion of Shepherd House (provision of rooms and offices for rent) to help the diocese towards financial self-sufficiency. Peace in the country and God's guidance to the government, especially as the 2016 elections approach..
Mission and evangelistic activities in the Diocese.